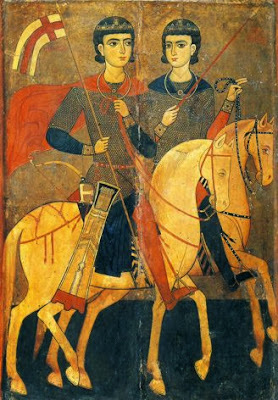 Saints Sergius and Bacchus were soldiers of the Roman army who served in the military ranks of Emperor Maximian. Distinguished for their prudence and wisdom, as well as for their prowess on the battlefield, the emperor proceeded to award them high military offices. But the admiration and sympathy of the emperor for both young men changed into a problem in the beginning and then hatred when he was informed they were Christians. For this reason he ordered a pagan ritual and sacrifices to be organized and he invited them to attend. When they refused to do this and confessed their faith in Christ with boldness and courage, Maximian was enraged and he ordered the removal of their honors and their humiliation. Their fellow soldiers, having derided and humiliated them, then sent them to the cruel Governor of the East, Antiochus, who with unprecedented ferocity lashed Bacchus to death. Sergius, however, was dealt with in another way, because it was remembered how one time he did him a benefaction. It was first proposed that he deny Christ and be granted life, but because he remained steadfast in his faith, he was beheaded. In contest you were victorious warriors of the Trinity and an illustrious pair of martyrs, Sergius the godly champion, and Bacchus the noble athlete. In the radiancy of your glory you shelter those who cry: Glory to Him Who has strengthened you; glory to Him Who has crowned you; glory to Him Who through you works healings for all. 1. "Sergius the godly champion"
When students excel in their studies, as is natural, they rejoice, and the parents rejoice and are proud of their children when they thrive and excel. And of course this is not a bad thing and no one would condemn it, but it must be emphasized that it is of greater worth for one to excel everyday throughout their earthly life. To excel in their ethos, namely their way of life and behavior. To excel in true humanity, which has its root and source in pure faith as experienced and taught by the Orthodox Church. To excel in patience during times of temptation, sorrow, illness, adversity and the failures of this life. To excel in dealing with death, which, despite being trampled and destroyed by the Resurrection of Christ, it still causes terror and trauma to all those who live outside the Church, far from God. While for the Saints, and all those who have placed themselves in the perspective of sanctification, death is nothing but an excursion and "transition from death to life". Therefore, the excellence which has the greatest value and importance for each person is to excel in life, which is directly connected with our internal state, and becomes apparent with our way of life and conduct, especially how we treat the difficult and serious events of our life, primarily death. For the way in which someone departs this world testifies to their inner state, that is, how they lived and conducted themselves, even their internal change at the "eleventh hour", since God economizes the events of everyone's life in this way, that the well-intentioned can find their path "in this present life" even just before their departure. The blessed Elder Fr. Porphyrios of Kavsokalyva would say that the bed of pain, especially through the sickness of cancer, sent many people to Paradise. In other words, many received excellence in their contests throughout their lives and others excelled at the end, but with much effort and great struggle against the long habit of sin. 2. "Bacchus the noble athlete"
Certainly, however, excellence requires effort, asceticism, struggle, patience and above all bravery so that one does not lose heart through failures, adversities and the difficulties of life. The brave athlete of spiritual contests knows very well that, even if a daily "battle" is lost, this does not mean that all is lost, since the war against the devil, the passions and sins continues until the end of our earthly life. This is why hope is not lost, but humility, power and the mercy of God are sought and simultaneously we get up and continue undaunted in our effort and struggle. One who has patience and bravery admires the Saints as superhuman warriors, they are exemplified by this and they try, always to the extent of their strength and spiritual guidance, to imitate them. While the coward, when he studies or hears about the exploits of the Martyrs, Venerable Ones and generally all the Saints, because of their laziness and reluctance to compete and wrestle with great and high things, consider it excessive and unfeasible for himself and unfortunately becomes offended and hurt. So it must be stressed that those who follow Christ, and struggle to become 'brightly-figured children of the Church" and gods according to Grace, are not cowards, but are brave. They are what their heart says, they who have "guts" according to the common saying. Bravery contributes greatly to the fulfillment of people and success in the purpose of their lives, which is the acquisition of excellence, namely communion with the living God. Source: Ekklesiastiki Paremvasi, "Μεγαλομάρτυρες Σέργιος και Βάκχος", September 2010. Translated by John Sanidopoulos.